From the town of Heppenheim, between Darmstadt and Mannheim, Vettel grew up with his father - who was a carpenter - racing karts and in hillclimbs. When he was three his father gave him a small kart which Vettel raced around the garden. He was not allowed to compete until he was seven when he started racing Bambini Class karts and won his first victory at the Wittgenborn circuit, near Frankfurt that year. In 1997 he joined TonyKart importer Peter Kaiser's KSN team and stayed with the team for the next few years, winning various regional and national titles and landing support from Red Bull. His big break came in 2001 when he was German Junior Champion and won the European Championship with the TonyKart factory team. At 15, with the help of Red Bull, he switched to Formula BMW with the Eifelland team and won five races, finishing runner up to Maximilian Gotz. He then switched to Gotz's ADAC Berlin-Brandenburg team in 2004 and won the title with 18 wins in 20 races. He then joined Mucke Motorsport in the Formula 3 Euroseries but failed to win a race although he finished fifth in the series. For Macau he switched to ASM and finished third. At the end of the year he had his first test with BMW Williams, as part of his prize for winning the FBMW title. In 2006 he joined ASM, taking over from the previous champion Lewis Hamilton and he won four races but was beaten to the title by his team-mate Paul di Resta. He also took part in several Renault World Series events and won one of them but nearly lost a finger at Spa when he was hit by flying wreckage. Despite this he was back in action within a week. In Turkey he became BMW's third driver after Robert Kubica was promoted to replace Jacques Villeneuve. The 2007 season saw him and competing in the Renault World Series but when Kubica had a big accident in Canada, the team turned to Vettel to race in the US Grand Prix at Indianapolis and became the youngest driver ever to score a point in F1 with eighth place. Within a few weeks he had been signed by Scuderia Toro Rosso to replace Scott Speed and at the end of the year he finished fourth in China in dreadful weather conditions. He stayed with the team in 2008 and in Monza stunned the F1 community by taking pole and winning the race, becoming the youngest F1 race winner by nearly a year. He ended the season eighth in the World Championship. He was signed to drive for the Red Bull Racing team in 2009. In 2009, only his second full season in F1, Vettel won four times - in China, Britain, Japan and Abu Dhabi - and finished second in the drivers‘ championship with 84 points to Jenson Button‘s 95. At age 22, he was the youngest-ever runner-up in the world championship. He made mistakes, tangling with Robert Kubica in Australia, crashing out of the points in Monaco, and running wide in Turn 10 on the opening lap in Turkey [where he had qualified on the pole] which let Button slip by to take the lead. Where Vettel really proved his raw speed, however, was in qualifying where he outpaced teammate Mark Webber at a ratio of 15 to 2, and he won four poles to Webber‘s one. Given that Webber is known for his one-lap qualifying speed, Vettel was very quick indeed. The Red Bull Renault RB5 was an extremely fast car, but the fact that it did not have a double-deck rear diffuser until Monaco probably cost the team the championship in 2009. In 2010, the Red Bull Renault RB6 was the class of the field, but the fierce fight between five drivers for the title meant that Vettel did not clinch the championship until the season finale in Abu Dhabi. At the age 23 and 133 days, Vettel became the youngest ever world champion, beating the record set by Lewis Hamilton by 168 days. Vettel won five races: Malaysia, Valencia, Japan, Brazil and Abu Dhabi. He also earned 10 poles, thus becoming the seventh F1 driver to win 10 or more poles in a season. The others were Ayrton Senna, Jacques Villeneuve, Mika Hakkinen, Alain Prost, Schumacher and Nigel Mansell, who holds the record at 14. Again, Vettel‘s pure speed and talent were punctuated by mistakes. The most glaring one was when he tried to pass Webber for the lead in Turkey, turned back too soon, and crashed out of the race. Vettel also tangled with Button in Belgium. And in Hungary Vettel had to serve a drive through the pits penalty when he dropped too far behind the safety car while, ironically, trying to help teammate Webber eek out some distance on the rest of the field. 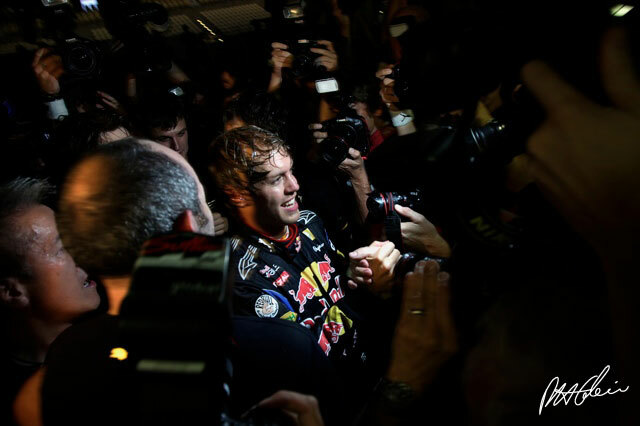 The incident in Turkey strained relations between Vettel and Webber, especially as the latter believed that the former was Red Bull‘s favored son. After the end of the season, however, the duo talked things over and healed any rifts that remained. The team had to share the blame for Vettel not wrapping up the title sooner because assorted mechanical and reliability woes cost him wins in Bahrain, Australia and Korea, plus robbed him of points in Spain and Italy. During the first 18 races of 2010 the lead in the championship changed eight times between five drivers - Fernando Alonso, Felipe Massa, Jenson Button, Mark Webber and Lewis Hamilton. Vettel [who won three times in the last four races] led only once, when it mattered, after the 19th and final round.